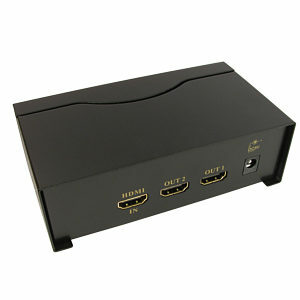 Newlink 2 Way HDMI Splitter, Distribution Amplifier. HDMI female input port, 2x HDMI female output ports. Splits and replcates without signal loss or degradation. Supports HDTV resolutions 480p to 1080p and 3D. Cascadable up to 3 times. Recommended max cable lengths : up to 10 meter before splitter and 20 meter after. Q: Is this splitter suitable for Sky HD? Q: Can the splitter be used with CAT5 extenders? A: Yes it will work with extenders. Q: Will I lose any signal quality? A: No, all outputs will produce an identical signal without loss. Our 2 way HDMI splitter is perfect for distrbuting the same HDMI signal to 2 separate TVs, for example watching Sky HD on 2 TVs at the same time (same channel).